What would happen to the counters? 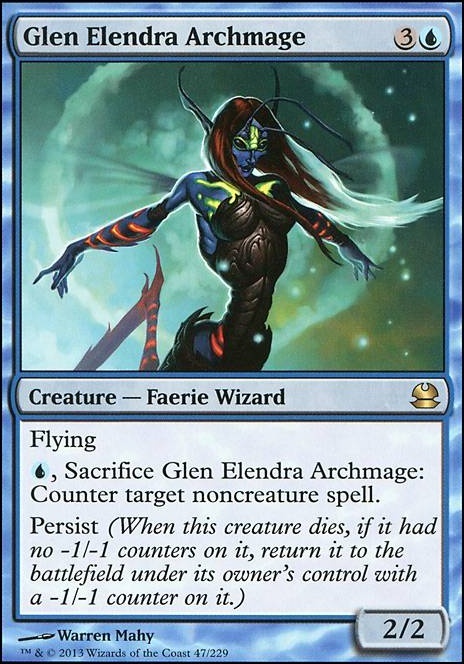 , Sacrifice Glen Elendra Archmage: Counter target noncreature spell. 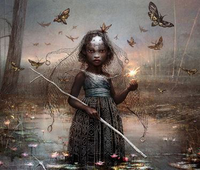 Equilibrium : Felt bad too draw too many times, i do think its good but cut it for creatures. Glen Elendra Archmage & Spellseeker : keep adding and dropping them. Probably will readd again once i find what to drop. Very nice deck. I do have a few suggestions though. Equilibrium - 2nd best bounce enabler here and typically hardest to remove. Exploration - Another T2 Animar option that's still useful later. Glen Elendra Archmage - Best counterspell body here. Glimpse of Nature - One of your best draw options here. Spellseeker - Typically your first target will be Weird Harvest to tutor up Ancestral Statue/Walking Ballista and win with only 5 mana and 2 counters on Animar (3rd counter coming from Spellseeker). That or Imperial Recruiter into Spellseeker into Ballista/Statue for 6 mana. Command Beacon - never pay Commander Tax again. Cephalid Coliseum - Essentially draw 3 for on a land here. Crystal Vein - up to in one turn. Bear Umbra - This card is amazing here. Advance your own plan on your precombat main, swing, then hold up mana for answers (while typically having enough mana to still play more stuff on your post combat main phase). 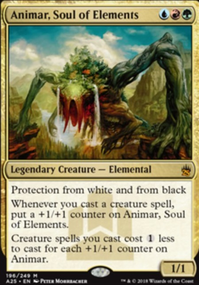 Song of the Dryads and Imprisoned in the Moon - Backbreaking against the right commander, very versatile, and if they manage to get rid of it you just recast 'em. Diabolic Intent - Great tutor that'll never be more reasonably priced. Glen Elendra Archmage - Same as above but replace 'tutor' with counterspell body. Yeah, I'm going to need to fit Neoform in. 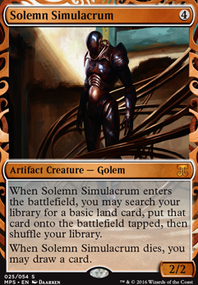 You can grab Neoform with Spellseeker and then sac the Spellseeker for Ancestral Statue . 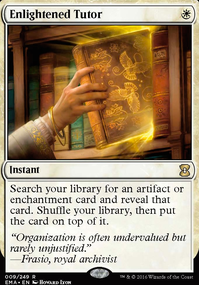 That's a pretty decent alternate line if you either don't have the mana or think that it's too risky that turn to choose and cast Weird Harvest. 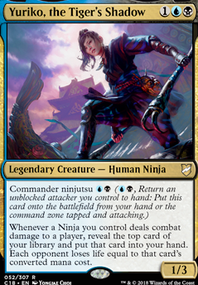 Taking a 2 drop and turning it into Rishkar, Peema Renegade should help spread around a significant number of counters to ramp you, but that's the least powerful synergistic interaction that Neoform offers. Most of the time you are going to be using it to go from a 2 drop into one of your tutor creatures or a 3 drop into either Ancestral Statue or Glen Elendra Archmage . Last_Laugh good call on Glen Elendra Archmage I will definitely be picking one up. You seem really experienced with deck building so does anything jump out to you as something which I should take out for Bear Umbra and Imprisoned in the Moon ? Last_Laugh I think those are some great suggestions, but what do you should I take out. Also, I'm not playing Glen Elendra Archmage just because of cost which I know seems strange with Survival of the Fittest in the deck but anything that's over $5ish are things I already have. 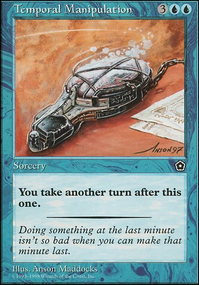 I put in Siren Stormtamer instead just because I had one already but it would definitely be an improvement. Glen Elendra Archmage and Siren Stormtamer both deserve spots for a counter suite. Spore Frog and Elephant Grass are both great for anti-aggro. Cephalid Coliseum and Command Beacon both deserve spots as well. I ran Imprisoned in the Moon in addition to Song of the Dryads. Also, depending on your meta, Mystic Remora and/or Aura Thief can be all-stars here. Last is Bear Umbra which quite frankly is amazing in Muldrotha. Being able to further your own gameplan on your first main phase while holding up mana for answers is very effective here and totem armor is nothing to scoff at either.